Since 1998 Eric has been imparting his love for snowsports (mostly snowboarding) on students from ages six through sixty six and beyond. As a AASI (American Association of Snowboard Instructors) level 3 certified snowboard coach, Eric has worked hard to hone his craft and ensure he is able to have the most impact on a student for their time and money. Eric works with anyone from beginners on the bunny hill to experts in the trees, steeps, bumps, ice, and terrain park. Many students take advantage of Eric’s background in video production and partner for video analysis of their snowboarding. 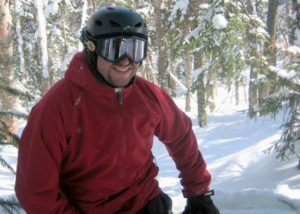 Eric is currently coaching and providing staff training at Blue Hills Ski Area, a small hill in Canton, Massachusetts (a suburb just south of of Boston) but he also spends many days on the slopes elsewhere throughout the New England and Mid Atlantic region(s). Eric is also available for coaching and movement analysis video session engagements by advanced appointment. If you’re interested in setting something up shoot Eric a message at Email@EricDresser.com. Catch you on the slopes!